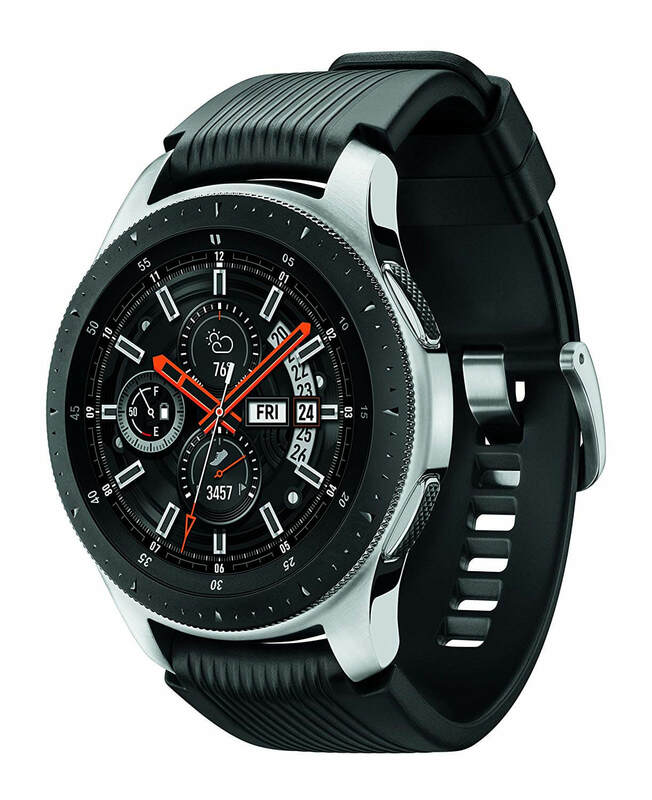 The SM R800NZSAXAR Galaxy by Samsung is a versatile smartwatch that’s loaded with a variety of fitness tracking features, a longer than average battery life, Bluetooth connectivity, and is both iOS and Android compatible. Many people believe that this model easily blows the Ticwatch S fitness tracker out of the water, offering a more intuitive, user-friendly interface, customizable features, and a variety of apps. But how did this fitness tracker really perform when it was put to the test? Our Verdict: A versatile watch that works for both iOS and Android smartphones, this is a smartwatch/fitness tracker that offers a nice balance of features that allow you to rely on it for more than just tracking your fitness stats. While it may have a somewhat chunky design, its functionality combined with customization options will quickly make you forget about the bulky design and instead focus on how this watch helps you stay on track whether you have an appointment or you need to hit the gym for chest day. A great buy if you’ve had your eye on fitness trackers on the market but haven’t taken the plunge due to the high price tags that often come with them. Samsung offers a great solution in a highly customizable watch that’s beginner-friendly and designed to help you meet your fitness goals, whether it’s sending reminders for clean eating lunch ideas, alerts that you’ve been inactive for too long, or even a reminder that it’s chest day at the gym. This model can keep track of your eating habits, activity level, sleep pattern, scheduled meetings at work, and more. In the past, Samsung wasn’t really much of a contender when it came to their line of fitness trackers. But their latest line features a variety of upgrades and redesigns that have turned their smartwatches into devices that you can really rely on. This model is available in three color options and two size options. Additionally, you can choose from a wide variety of watch band styles. Fortunately, this fitness tracker does come with onboard GPS, which can come in handy if you love going for a walk or run and want to save waypoints or accurately track routes, distances covered, steps taken, and more. However, like any mobile device, GPS can easily zap the battery. Taking a page out of Apple’s book, this model also acts as a smartwatch and will notify you of your upcoming appointments, allow you to keep track of your schedule for the day, sends text notifications, and even keeps you up to date on current weather conditions. The wireless charger will allow you to charge your fitness tracker without taking it off, however, most users reported the watch must be in the same room as the charger in order for it to work. Unlike past models by Samsung, this model is waterproof up to fifty meters. This means it can be submerged up to fifty meters without damaging the watch. Fitness trackers that are merely water resistant can only handle light contact with water. With this model, you can wear it swimming, waterskiing, when you take a shower, or during a heavy downpour. This is a huge plus if you enjoy plenty of water-related activities, or you don’t want to have to worry about remembering to remove your fitness tracker before you take a hot shower. This fitness tracker also has a high battery life rating at four days, which is above average compared to other models in this price range. However, if you’re looking for a model that offers a significantly longer battery life you can click here to read our buyer’s guide and get an in-depth look at models that offer seven-thirty day battery life ratings. This newly updated model offers plenty of workout options, including thirty-nine tracked workouts in total, twenty-one of which are indoor exercises. The fitness tracking features and the sleep monitoring option both tie into the S Health app. Sleep monitoring will give you an in-depth look at how well you sleep at night, how often you toss and turn and wake, and how much restful sleep you really get each night. This can give you a better idea as to why you’re not seeing the gains or weight loss you’re looking for, or why, despite going to bed early, you’re always exhausted. Considering this is a Samsung fitness tracker, obviously, it works well with any model of Samsung Galaxy phone. However, it does also work with some iPhones and Android phones. To use with other types of smartphones you’ll need to download the Galaxy Watch app if you have an iPhone, or the Galaxy Wearable app if you have an Android phone. Do you want a fitness tracker that allows you to customize the watch face and overall style of the watch? This Galaxy watch delivers, allowing you to choose from a wide variety of watch bands and thousands of watch faces. The display consists of an AMOLED high-contrast display, giving the watch face a more detailed look compared to competing models. You can download apps or new watch faces via Bluetooth or Wi-Fi if you have a noncellular model, or you can download new apps and watch faces using the dedicated app. If you have a premium Spotify membership you can download your playlists to this fitness tracker. The Galaxy Samsung smartwatch with fitness tracking capabilities features a new and improved design, top fitness tracking features including built-in workouts and GPS capabilities, and a waterproof design that makes this model perfect for the avid swimmer. Affordable, versatile, easy to use, and designed with basic smartwatch features, this multitasking watch is reliable and a great buy if you want many of the features you’ll find on top of the line fitness trackers, for a fraction of the price. We gave this model a rating of four and a half stars out of five stars.